Scott Condon/The Aspen TimesTroy Geringer, heavy equipment operator with Colorado Parks and Wildlife, uses a bulldozer to build a berm higher at the target end of the rifle range at the Basalt Shooting Range. A fire started last week on the hillside behind the berm when shooters placed targets beyond the 100 yards allowed. The higher berm is intended to catch all bullets and prevent a spark from igniting dry fuels. BASALT – Colorado Parks and Wildlife started fire-safety improvements Thursday at the Basalt Shooting Range in an effort to get the facility reopened for eager sportsmen while assuring town residents that there is little risk of wildfire. 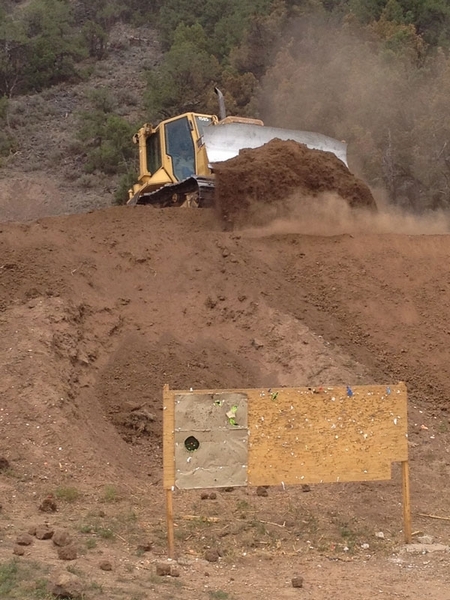 A bulldozer started building up the dirt berm Thursday on the target end of the rifle range to better absorb bullets and discourage use of a hillside behind the berm for target practice. A wildfire broke out on that hillside Aug. 4 and charred 2 acres before it was contained by valley firefighters, who prevented the flames from climbing a ridge, burning power poles and threatening the adjacent high-end housing at the Wilds. The berm will be increased to between 18 and 20 feet and shaped in a horseshoe around the target area of the rifle range, according to Perry Will, Area 8 wildlife manager. Colorado Parks and Wildlife also will require that users of the rifle range honor a requirement that targets not be placed more than 100 yards away. Firefighters reported finding metal targets in trees on the hillside, well beyond the 100-yard limit, Will said. He earlier explained that use of steel-jacketed bullets with steel targets can produce a spark that ignites a fire in dry vegetation. Heavy equipment will also be used to cut a fire break behind the shotgun and pistol ranges. Those ranges don’t need a berm because that type of shooting isn’t likely to start a fire, Will said. In addition, a State Wildland Inmate Fire Team (SWIFT) crew from Juniper Valley-Rifle will use hand tools to clean up the burned area and create a fire break between the shooting range and two buildings in The Wilds. The work will be on state-owned lands. The Juniper Valley-Rifle crew of 20 workers will cost $1,600 per day and five or six days of work are required, Will said. The crew has extensive training on federal fire fighting and fire prevention. They are supervised by guards while working. Roaring Fork Valley Sportsmen’s Association, a club for target shooters, offered to pay for a day of the work, according to Will. Near The Wilds, the crew will remove limbs from pinyon and juniper trees, so flames can’t spread as easily, and they will remove some dead and dying trees. The fire break will be tied into existing open areas. Will said Colorado Parks and Wildlife will seek advice from the Basalt Fire Department on whether or not the work creates defensible space for firefighting. Once that goal is achieved, the shooting range will reopen, Perry said. No timetable has been set. The public shooting range gets hundreds of visits from target shooters per week. Will said Colorado Parks and Wildlife is getting “lots of pressure to reopen,” he said. Will urged patience. Basalt Deputy Fire Chief Jerry Peetz said department officials toured the shooting range earlier in the week and offered advice on fire mitigation. He credited the state agency for creating the fire break needed to prevent a wild fire from blowing toward downtown Basalt when winds conditions are right. Downtown is less than 1 mile away from the shooting range. “That fire (last week) was kind of our worse-case scenario,” Peetz said. Fortunately winds weren’t blowing hard enough to push the flames toward town before firefighters contained the fire. While the fire department will offer it’s advice, it doesn’t have any official role on the shooting range’s status, Peetz noted. “We’re not calling the shots on when that thing opens,” he said. The shooting range is part of the 5,500-acre Basalt State Wildlife Area. Colorado Parks and Wildlife used hand crews to clear out pinyon and juniper trees on about 30 acres three years ago. The project created habitat for mule deer and elk as well as created a fire break. In addition, Xcel Energy cleared pinyon and juniper trees about one month ago from beneath a major power line that runs through the wildlife area. Basalt Mayor Jacque Whitsitt said she hasn’t seen the work Colorado Parks and Wildlife is performing, so she couldn’t comment on its adequacy. She said “potentially there needs to be enforcement officers around” at the shooting range to make sure regulations are followed. Will said parks and wildlife has determined more enforcement is necessary. Financial constraints limit the amount of time a wildlife officer can spend at the shooting range. Whitsitt suggested the hours of the range should possibly be adjusted to when a wildlife officer can patrol.